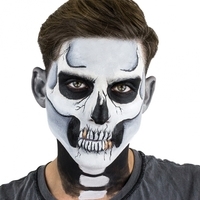 Classic Skull Stencil kit includes everything you need for a great skull look to top your reaper or ghoul costume! Kit includes water-activated makeup in black, white and gold, along with the stencil and a makeup brush. Makeup dries fast and washes off easily with soap and water.